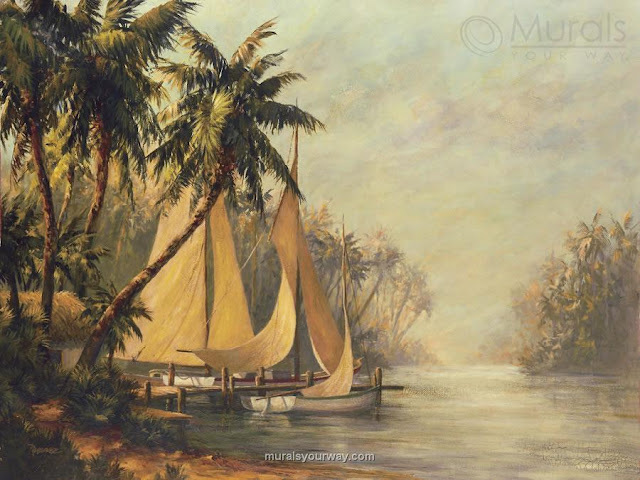 In this painting by Malarz, sailboats sit idle with golden sails at a dock bordered by a palm forest. The warm glow of humidity hangs on the horizon, creating a sense of mystery. You can get prints of this in various sizes and prices starting from around $40. Check out samples on Google's shopping network, here. It's super hard finding out info on the artist, Malarz. I have found out that he's an artist from Florida that lives and works out of Venice. He gets commissioned a lot by private corporations for his self-taught style of art. most of his work details an easy going life in and around the water. Check out more work by Malarz here: www.bentleydigital.com/Malarz.